The OSIRIS-REx spacecraft's protective cover is removed at NASA's Kennedy Space Center in Florida. A NASA asteroid-sampling probe has entered the home stretch of its prelaunch preparations. Mission team members are now fueling OSIRIS-REx and testing its software, scientific instruments, solar panels and other critical systems before moving the probe to the pad for an expected Sept. 8 launch, NASA officials said. "Delivering OSIRIS-REx to the launch site marks an important milestone — one that's been many years in the making," Rich Kuhns, OSIRIS-REx program manager at Lockheed Martin Space Systems, said in a statement. "The spacecraft has undergone a rigorous environmental test program in Denver, but we still have plenty of work ahead of us," Kuhns added. 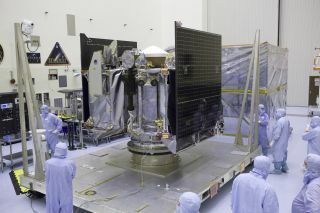 "Many on our team have temporarily moved to Florida so they can continue final processing and have the spacecraft ready for the Sept. 8 launch date." After liftoff, OSIRIS-REx — whose name stands for Origins-Spectral Interpretation-Resource Identification-Security-Regolith Explorer — will embark on a two-year cruise to the near-Earth asteroid Bennu. Upon arrival in 2018, the probe will study the 1,650-foot-wide (500 meters) Bennu from orbit for two years. In 2020, OSIRIS-REx will snag a sample weighing at least 2.1 ounces (60 grams), and this sample will come back to Earth in 2023, if all goes according to plan. Bennu is expected to harbor water and organic molecules that could share a history similar to that of such substances on Earth, NASA officials have said. Bennu is also a potentially hazardous asteroid, so studying the space rock up close could have planetary-defense implications as well, mission team members have said. OSIRIS-REx will not be the first spacecraft to return asteroid samples to Earth. That distinction belongs to Japan's Hayabusa probe, which sent pieces of the space rock Itokawa home in 2010. OSIRIS-REx arrived at Kennedy Space Center after a flight aboard a U.S. Air Force C-17 cargo plane, which took off from Buckley Air Force Base in Aurora, Colorado.